Making hot cross buns on Good Friday morning with my mum is one of those treasured childhood memories. 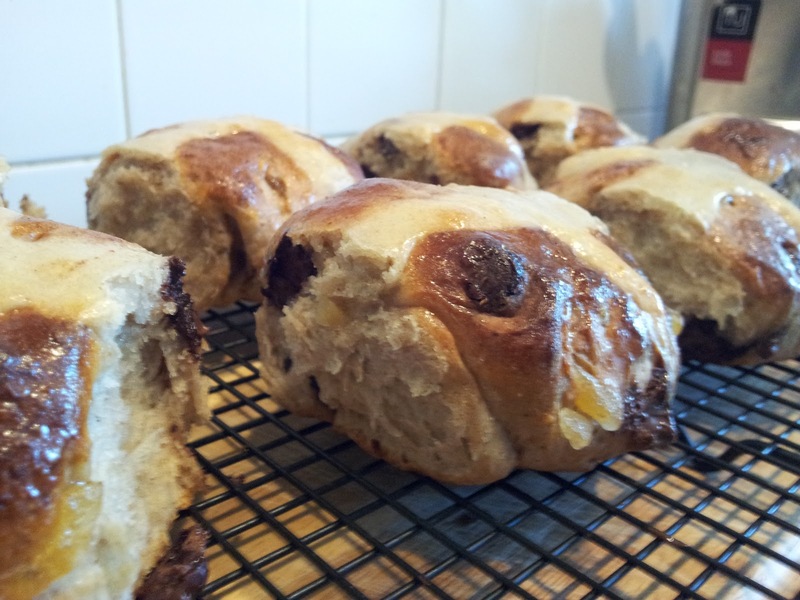 From the mixing and kneading to the sizzle of the bun glaze on oven-fresh buns there was nothing that I looked forward to more every Easter. Of course, you grow up and life changes. She got married and moved away (we lived with my grandparents and I chose to stay with them). She still made buns but I got them at teatime when I visited. I left home and visits were on Easter Sunday for the traditional turkey lunch instead. If I was lucky I got a toasted two-day-old bun. But it was never the same as ones that were fresh from the oven. I figured that this year, as part of the challenge, I should make my own. That way, when Miss A is old enough, we can make them together and hopefully she'll remember the tradition with fondness and a little lump in her throat when I've long since departed from this earth. 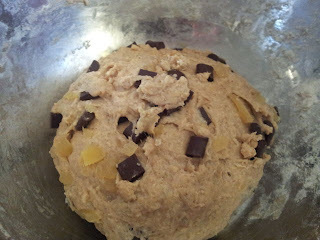 Anyhoo, in general, I don't like things with currants, sultanas or raisins in. Don't get me started on the subject of fruit scones. I do make an exception to this rule for seasonal items (Christmas cake and pudding, hot cross buns etc) but you'll usually find I've meticulously extracted all the fruit to play Tinker, Tailor... on the side of my plate. 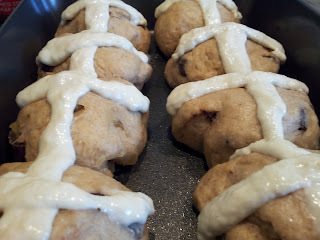 So when Jules tweeted about her recipe for Stem Ginger and Chocolate Hot Cross buns, I knew I had to try them. My beloved Grandma would have loved these as ginger and chocolate was one of her favourite flavour combos. When she passed away, something weird happened and I suddenly found myself eating all the things she used to like such as smoked salmon and cream cheese sandwiches and chocolate ginger biscuits - things which during her lifetime I would've turned my nose up at. It wasn't quite that spooky though as I still won't touch Branston Pickle, Piccalilli or Frys Turkish Delight! Jules created the recipe based on one from the Fabulous Baker Boys. I love that in her blog she specifies the criteria she was looking for in the finished bun - with lovely soft innards being at the top of the list. Recently, the Weekly Bake Off challenge was for Mary Berry's Hot Cross Buns but the picture in the book put me off - hers looked like small, round rocks. Jules in contrast were large and pillowy. I was completely sold. Skipping my morning run this morning in favour of bun making (I seriously have to do more of the former and much less of the latter before I turn into a weeble), I opted to make the buns by hand rather than with my mixer because I didn't want to wake the rest of the house up. It was really satisfying to bake by hand. I've gotten so used to letting the Kenwood take the strain unless I'm doing a Dan Lepard recipe (plus it makes it easier with a toddler underfoot) but I really think it takes the joy out of baking some days. I was tempted to try Dan's method of knead for 10 seconds, rest for 30 minutes, repeat several times but I was impatient to have my first bun of the year so did one ten minute knead. My kitchen was really cold today so it took ages for them to rise but they got there in the end. I also loved that Jules uses proper crosses. Why on earth anyone would want a pastry cross on top is beyond me. It seems plain weird. My only tip would be to be careful about how much you snip off the end of your piping bag. What I thought was a small hole actually made really big crosses and on a couple of the buns, the cross melded into itself leaving a big white patch in the corner. Ah well, you live and learn. The finished buns were beautiful. The mixed spice gives a lovely flavour throughout the soft crumb. The chocolate and ginger is a welcome surprise. Miss A polished off a half before they were barely out of the oven and announced that they were 'Yummy scrummy in my tummy'. A little later, we were out perusing cars and I'd taken one along with us for an emergency snack. The lady garage owner ended up asking me all about them because she said they looked amazing and she's going to give them a go too. You can find Jules' recipe over on her blog. Thanks so much for sharing Jules. Will definitely be making these again!